After a long wait, Xiaomi finally launched its Redmi Note 6 Pro smartphone on Thursday. Two front and two rear cameras are provided in the new Redmi Note 6 Pro device. In an event held in New Delhi on Thursday, the company took a new device from the new Redmi Note Series and revealed its price. Let us know that the new Redmi Note 6 Pro will be sold exclusively on the online shopping website Flipkart. Remind that Xiaomi's phone has been launched in Thailand and Indonesia. 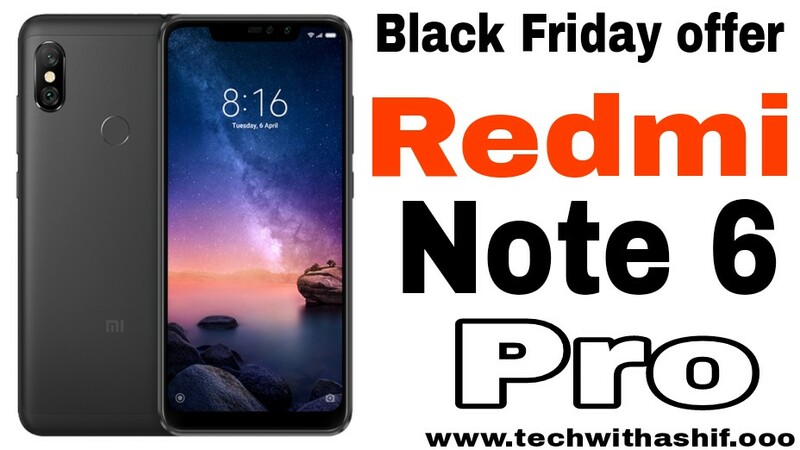 Xiaomi is priced at Rs 13,999 for the 4 GB RAM and 64 GB storage variant of the new Redmi Note 6 Pro. At the same time, 6 GB RAM and 64 GB storage variant will be available for Rs 15,999. The company has already confirmed that Black Friday sale will be available from November 23 on the new Redmi Note 6 Pro e-commerce website Flipkart. 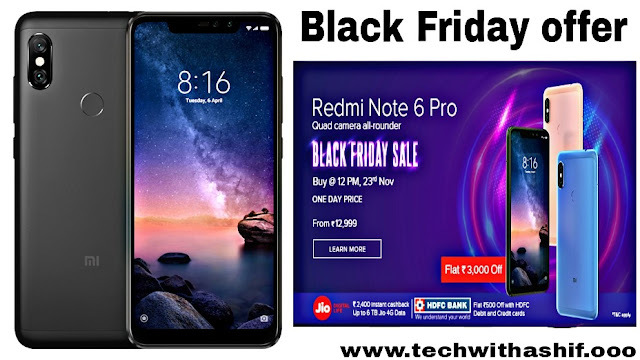 In the Black Friday sale, the 4 GB RAM variant of the Radmi Note 6 Pro will have an opportunity to buy a special price of Rs. 12,999 and 6 GB RAM variant for 14,999 rupees. The company has partnered with HDFC Bank for the Black Friday Sale, through which a rebate of Rs 500 will be given. On Friday, the company will announce about a special sale. Sale will be organized for the smartphone at 12 noon on Friday. Apart from this, it will also be sold on mi stores and mi.com. Phone will be available in Red, Blue, Rose Gold and Black color. Under the partnership with Reliance Jio, the phone will get Rs 2,400 cashback and 6 TB additional 4G data on the phone. In the box with the Redmi Note 6 Pro, the company is giving a protective case free of cost. Soon the phone will be made available on the offline store at the All Preferred Partner Store, Mi Rural Store. 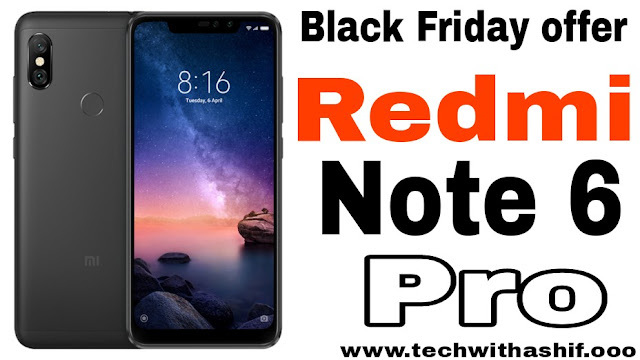 Redmi Note 6 Pro has a 6.26 inch FullHD + 2280 × 1080 pixel resolution with an aspect ratio of 19: 9. Corning Gorilla Glass is available for the protection of Redmi note 6 Pro display. Screen density is 403 ppi. The phone has a 1.8 GHz octa-core Snapdragon 636 processor. Talking about storage, Xiaomi has given 64GB of storage in the phone with 4 GB and 6 GB RAM. The storage of redmi note 6 pro can be increased by up to 128 GB via microSD card. Redmi note 6 Pro has a display design and has a dual front camera. This smartphone of Xioami is made from Aluminum Unibody and has a vertical dual rear camera on the rear. Redmi note 6 Pro comes with Hybrid Dual SIM and Dual Rear Camera setup. Redmi note 6 pro smartphone also has fingerprint sensor and infrared sensor. Smartphone Dual SIM Dual VoLTE Supports That is, the 4G VoLTE sim can be used simultaneously on both sim slots. For photography, the phone has a 12-megapixel primary sensor and 5-megapixel secondary sensor with aperture F / 1.9, dual-pixel autofocus, EIS and dual-tone LED flash. The company claims that even in low light the clear and sharp pictures can be taken by the new Redmi Note 6 pro. The rear and front camera comes with AI Scene detection. In front of the phone, 20-megapixel primary and 2-megapixel depth sensing secondary set-up has been given. Xiaomi Redmi Note 6 Pro has 4000mAh battery. Battery Quick Charges 3.0 Technologies offers The smartphone runs on the Android 8.1 OSO operating system based MUI. The dimensions of the phone are 157.9 x 76.38 x8.2 millimeters. For connectivity, Redmi Note 6 Pro has 4G connectivity options like VoLTE, 3G, Wi-Fi, Bluetooth and GPS.